The Northern Lighthouse Board was created by an Act of Parliament in 1786. From 1802 until 1852, the Board’s main store was in Leith but in 1852 it took a 5-year lease on this site in Granton from the Duke of Buccleuch for £110. 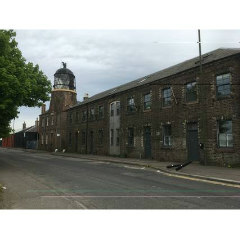 The Board relocated its stores and from 1874, the ship Pharos, the lighthouse supply tender, was docked in Granton Harbour. Between 1868-1869, The Board built the red-brick store. The experimental tower was added in 1874. Though the tower was built as a lighthouse, it never served as one. Instead, lighting and optical equipment was tested on this site before it was taken out on the ship to the main lighthouses around Britain. Granton was an ideal site for the stores and in 1907 they were improved and extended, with a railway siding and a travelling crane added. The engineering storage and test facility remained until November 2001, when it moved to a modern site at Oban and ended the Northern Lighthouse Board presence in Granton. Pharoes 1995 on the Forth during the parade of sail. 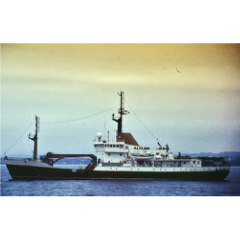 Photo from the John Dickson collection.